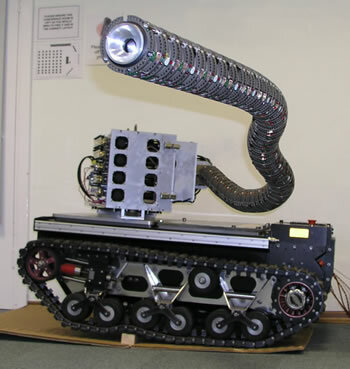 Snake-Arm Robots from OCRobotics have a wide variety of applications, particularly in restricted-access environments like nuclear repair, maintenance and decomissioning, bomb disposal, aerospace construction and more. Snake-arm robots are made up of a large number of segments. It is a tendon-driven, with wires terminating at various points along the length of the arm. The curvature and plane of curvature of each segment can be independently controlled. A motor is used to control the length of each wire independently. The control software calculates the necessary lengths of all the wires to produce the desired shape. The operator of the snake-arm uses a joystick to drive the tip; the rest of the arm follows the tip, driven by the control software. In this way, the tip of the snake-arm is able to work its way into very restricted areas. The body of the arm is hollow, which allows all service items to be carried inside, further increasing its ability to work in tight spaces. This kind of robotic arm is different from a previously covered item - the Octarm Robotic Tentacle which can actually grasp an object and manipulate it, in the same way that an elephant can use its trunk. Take a look at examples of fully autonomous snakebots. 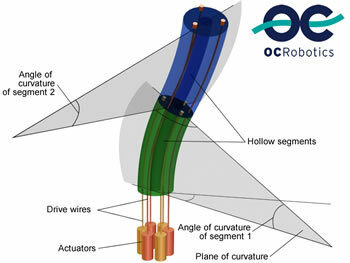 Read more about the snake-arm robot at OCRobotics (via robotgossip).